UPDATE: When I checked, September 2011, the website seems to have taken the comic maker down. There's a comic maker inside the Beano website, called "the great dennis and gnasher comic maker". 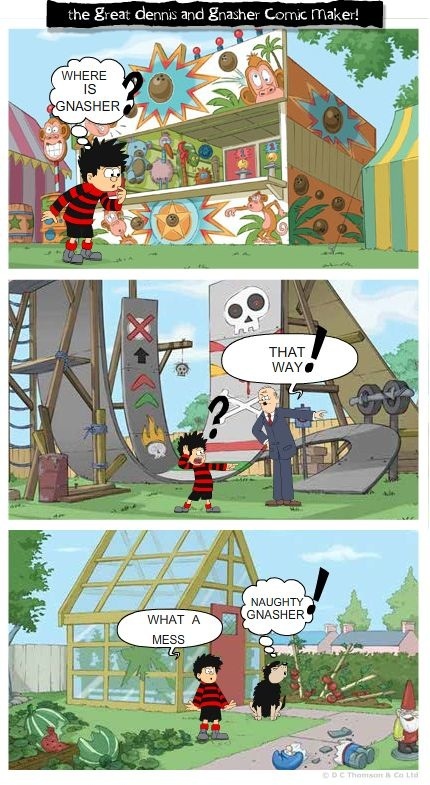 The Beano is a children's comic in Britain. You can download a sample or read one online on their about page. 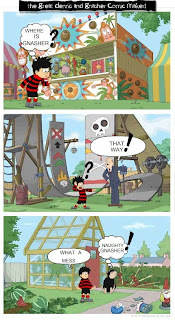 The comic editor features art work, characters and scenarios from The Beano. Creating a simple three panel comic is easy. The tricky part comes in writing the story. The interface is simple, mostly drag and drop to select your characters, balloons, effects and words, which are in a menu underneath that you scroll through via arrows. Backgrounds you can select by clicking the box next to "background", and you can edit your selections, making them bigger, smaller, flipping and rotating. There's a bin to get rid of selections you don't want, and you can toggle between panels without losing work. I loved the fact that when finished, you can save your comic to your own computer as a jpeg! What I found tricky is that you can't create your own text - you must choose from panels of words arranged alphabetically. For some children, the words themselves will act as prompts for the story; for others, lacking that one word they want to make the story perfect will drive them crazy. But for me, it was almost like a game: how can I make a story just from these words? If kids approach it the same way, I think they'll enjoy the creation process. At the very least, this is another comic editor to add to your children's literacy toolbox, and a fun online place to send them when it's write o'clock! I'll be adding this one to my list of comic maker's Susan. Many thanks. Joy, I am planning a huge roundup post on comic makers I like, but the problem is, I keep finding new ones before I finish the post! I reckon this comic looks a little more pleasing to the eye than the other comic programs you've showcased. You know? A little more professional. I think I would like to have control over what the character says... but then, I like you take on things too (as usual). Art work really makes a difference. This is a little retro, limited palette, maybe classier than some of the other comic editors. I figure it's best to draw your own but in my case, I'm grateful to anyone who lets me use their pics! This is a fun little tool, it does offer a bit of challenge with the writing!